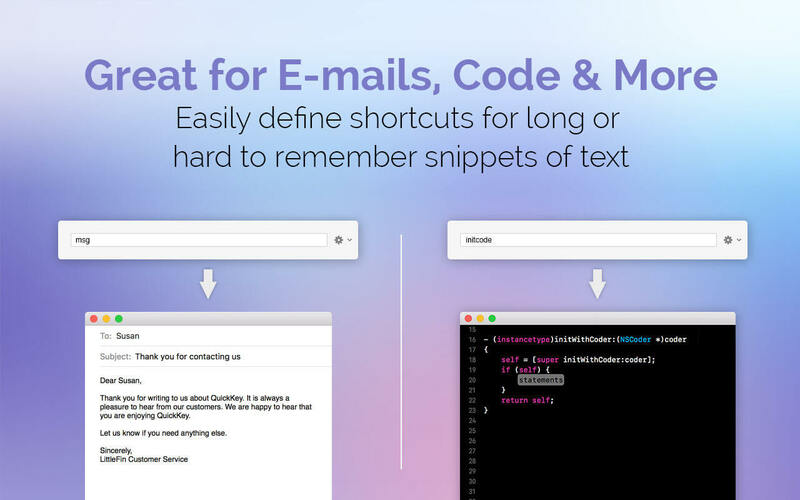 Save time typing by expanding short abbreviations into long phrases, code snippets, or entire e-mails. 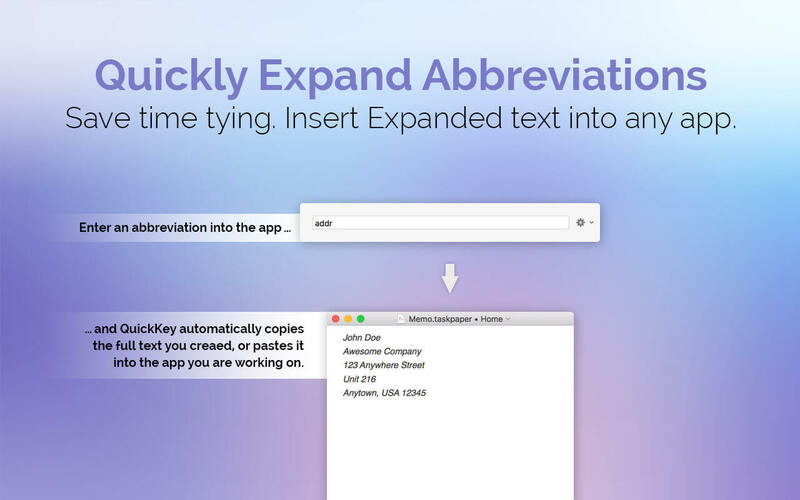 QuickKey allows you to insert expanded text into any app with a single keyboard shortcut. Stop typing repetitive or hard to remember text over and over, and make your life easier with QuickKey. QuickKey 2.0 now supports multiple placeholders—so you can define a block of text with multiple "variables", crafting entire e-mails. Set up custom e-mail signatures to insert on demand. 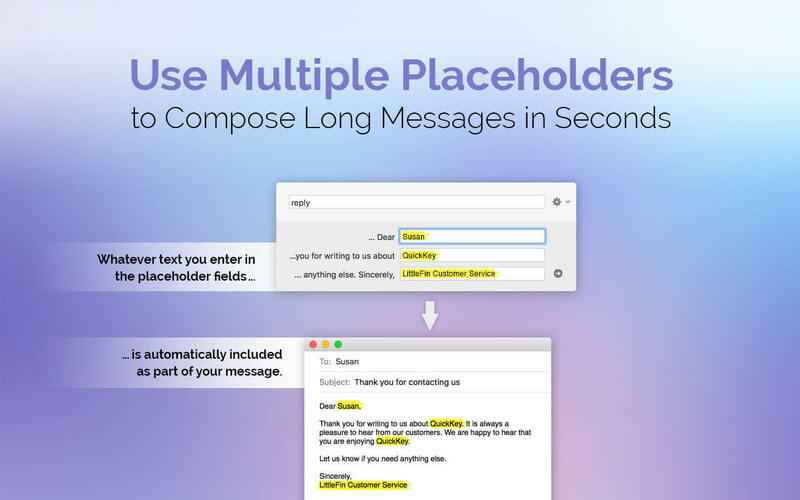 Quickly respond to e-mails with boilerplate replies. Insert snippets of code you use frequently. QuickKey syncs with iCloud so your shortcuts are available on all your Macs. Plus, a free companion iOS app allows you to view and use your snippets on the go. QuickKey is the first text expansion app built specifically for complete compatibility with the App Store and all Mac security measures. It is fully compatible with macOS High Sierra and sandboxing. It requires no special permissions to work. Text insertion is faster and easier with our free expansion companion app available at http://quickkey-app.com/extension/ but it is not required. New: Shortcuts auto-fill as you type. Press the return key to accept autofill, or just keep typing to ignore. Typing in a full shortcut will auto-copy like before. You can turn autofill off in QuickKey's preferences. Fixed: When inserting a shortcut with variables, variables will not disappear when switching to a new window. Minor bug & typo fixes.